This mission was the first of 5 to Cologne that Dad did during the War. 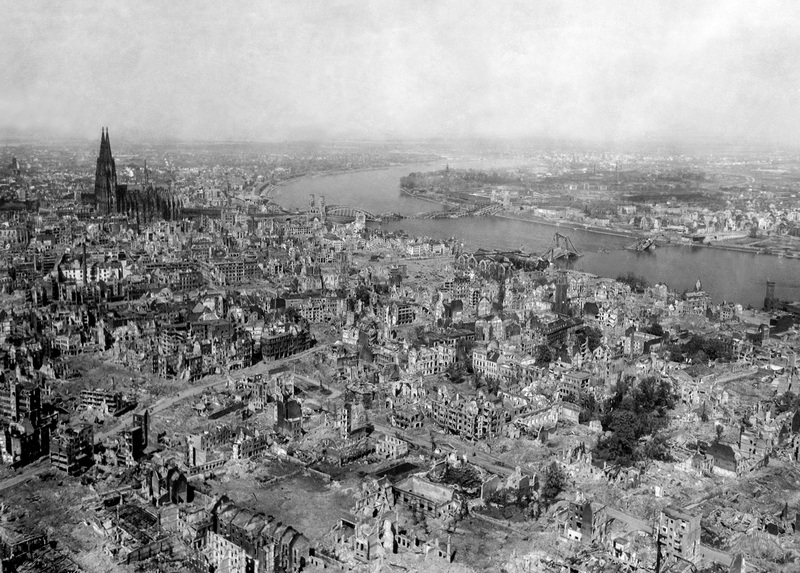 Cologne was a military area command HQ during WWII and it endured 262 air raids. This photo shows the devastation. In the upper left you can see the “Miracle of Cologne,” the Cologne Cathedral that suffered minimal damage compared to the rest of the city. Source: National Archives. Position: #2, #3 Element, Low Sqdn., 41st “B” Gp. Bombs Away: 0924; 25800′; -36 degrees C.
Remarks: Bombed by instruments. PFF. Intense & very accurate flak over target. Little damage because of excellent evasive action. Most flak I have ever seen. Flew thru it for 85 miles. Miracle we got thru. Very rough mission. My father Lt. Kenneth Gautsch was a lead bombardier for the 379th and was seriously wounded by flack on this mission. Thanks for the interesting information.